Springtime is coming, so get back into the swing of things with a new set. Choose from a variety of popular materials & accessories. Ride into the fun set! Discover dozens of plush ride-ons—from stationary rocking horses to battery-powered police cars. Any season can be the best for outdoor play activities, especially with a toy from one of our popular outdoor collections. Whether you're building the neighborhood's largest playhouse or just shopping for activities for a weekend barbecue, we've got the waterslides, inflatable bounce houses and outdoor sports activities you'll need to keep the kids entertained all year. Browse our outdoor play toy products easily by their suggested age range when you choose one of the age categories in the center of the page. If you're shopping for outdoor toys for babies and toddlers, you'll be able to choose from items like sandboxes, infant swings, water tables and height-adjustable basketball nets. Many toys in this category are built to grow with your child and are also useful to have on hand for multiple children of different ages. If you're browsing for a preschool-aged child, our large selection includes outdoor playhouses, small-scale swing sets and kid-sized sports gear. These toys often offer more permanent outdoor installations and can often remain useful for years to come. Toys recommended for ages 5 to 7 include foam rocket launchers, foam dart guns and large outdoor climbing playsets. 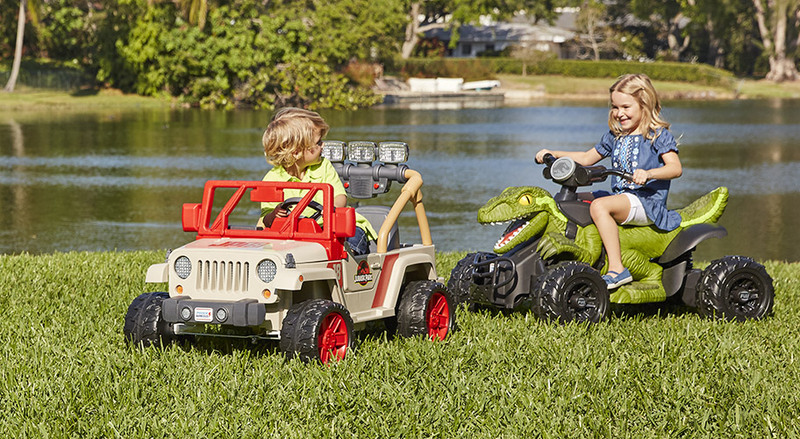 Outdoor toys in this age range offer a wide variety of activities for adventurous children. Older children in the 8 to 11 year old or 12 and over age categories might enjoy outdoor trampolines, advanced water guns or weather-resistant tetherball sets. If you're shopping for outdoor toys for children of varying ages, browse for favorites by selecting one of the most popular toy categories listed on the left side of the webpage. Once you've selected one of these or other groupings, you'll be able to sort your search results by store pickup availability, price or available shipping discounts. Outdoor games: The outdoor games department is the perfect place to browse when you're shopping for activities for a larger group of children who want to play together. Adventurous kids will delight in the variety of large inflatable toys, including soccer nets, basketball hoops and bounce houses. Some of these inflatable summer seasonal toys may also be useful in winter conditions. Look for clever outdoor reconstructions of typically indoor board games, such as tic tac toe or checkers, for large group gatherings and casual get-togethers with the neighbors. Blaster toys: A favorite outdoor toy for many age ranges, our large collection of blaster toys includes foam dart guns, foam ball blasters and even archery-inspired foam shooting designs. Whether you choose a single blaster toy for playful target practice or collect an arsenal for an all-out foam dart war, these favorites are durable enough to play with both indoors and out. Check out our selection of coordinating safety goggles, masks and vests for an extra level of protection while playing, and be sure to order an extra set of foam darts or balls if your child will be playing with a group. Swimming pools and waterslides: Above-ground swimming pools range in size from small inflatable baby pools to large, family-size permanent installations. But if you don't have the extra space for a full-size pool, our huge waterslide collection offers even more levels of fun. More than just a simple slide, many of the innovative water slide designs available combine water, climbing and bouncing for full-time inflatable fun. Look for features like integrated air pumps, slip-and-slide runways, and inflatable basketball nets to round out your outdoor summer water fun. Some specially designed water slides are even suitable for use in conjunction with above ground or in-ground pools for a double dose of outdoor water fun. Swing sets: If you're shopping for a backyard swing set, first think about the features that will appeal most to your children. Outdoor swing sets can range from simple swings to elaborate climbing and play structures that require a significant amount of space for installation. Once you've made a wish list for your outdoor space, browse for a set within your budget by using the refining controls at the top of the webpage. 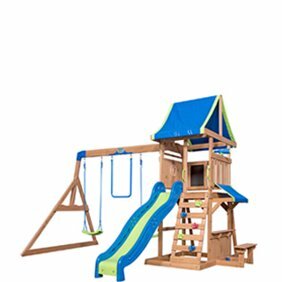 Our product descriptions list the dimensions of each swing set and each item that's included with the package. 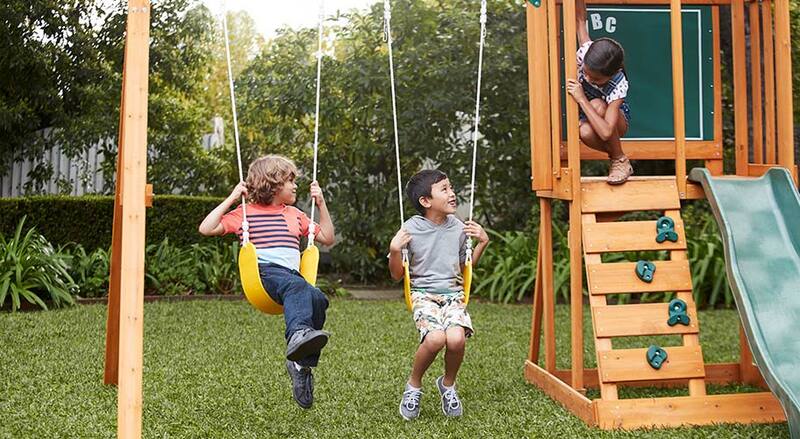 Look for swing sets that can grow with your child if you'll be installing them in a permanent location, with interchangeable infant swings, gliders or trapeze bars for extra versatility.